Heat oven to 350°F. In medium bowl, mix cookie crumbs and melted butter. Press in ungreased 9-inch pie plate. Bake 10 minutes. Cool completely. Meanwhile, in 2-quart saucepan, beat cornstarch, 2/3 cup sugar and the salt with whisk. Beat in half-and-half, 1/2 cup whipping cream and the milk. Beat in egg yolks. Add white chocolate. Heat mixture to boiling, beating constantly with whisk. Reduce heat to medium; cook until pudding coats back of wooden spoon. Stir in 1 teaspoon vanilla. Pour pudding into cooled pie crust. Cover with plastic wrap. Refrigerate 4 hours. In large bowl, beat 2 1/2 cups whipping cream with electric mixer on low speed, gradually increasing speed until cream begins to thicken. Add 2/3 cup sugar and 1 teaspoon vanilla. Beat until cream holds its shape. 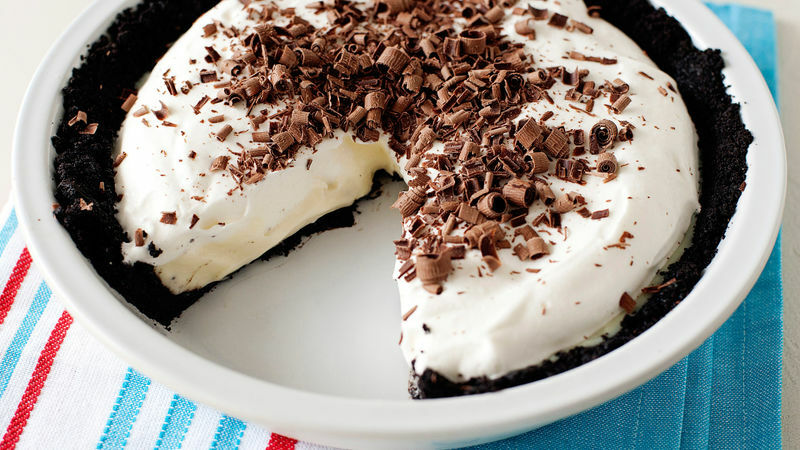 Top pie with whipped cream and chocolate shavings. Cut and serve. This white chocolate pudding is delicious on its own topped with some fresh berries. To shave chocolate, use a bar of frozen chocolate and a vegetable peeler to get the best curls. To ensure the pudding is very smooth, push the pudding through a strainer before you pour it in the pie crust.